Polar bears, microbes in your cells, unicorns, your pet hamster, lolcats: find a way to include an animal, today’s word prompt, in your poem. Or write about a situation that can bring out the animal in you (or someone else). Or dig deeper into the word’s etymology (anima = latin for breath). One way or another, give us a beast of a poem. Generally speaking, any poem that’s typographically arranged to represent a specific shape (recognizable or not) is a concrete, or “shape” poem. Poetry is, of course, a word-based form of expression. That doesn’t mean, though, that the visual layout of a poem can’t affect the way we read it. Taking this idea to a playful extreme is today’s (optional) form to explore: concrete poetry. Also known as shape poetry, the idea here is to arrange your words on the screen (or the page) so that they create a shape or an image. The meaning of the image can be obvious at first glance, or require some guesswork after reading the poem. It’s up to you to decide how difficult you want to make it for your readers. Now might be the perfect time to revisit some formatting tools that are particularly relevant for concrete poems (hint: indentation, line breaks, and pre-formatted text are your friends). Poets have long been fascinated with the potential of painting an actual image with their words — on top of the mental one those words evoke. A wave, a cross, a face, a letter from the alphabet: experimenting a bit with spacing, indentation, and line breaks will take you far. If you’re about to give up, don’t — you can always write/draw your poem by hand, then scan it or snap a shot of it with your phone, and upload it to your blog. 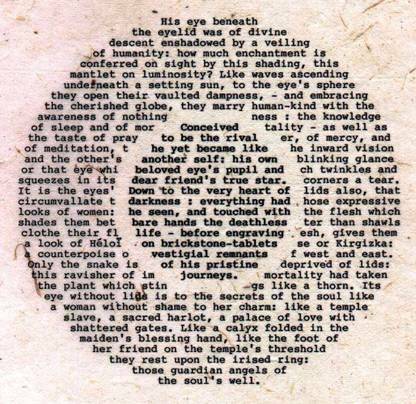 At its best, concrete poetry helps bridge the gap between text and image, and underscores or plays against an element already within the poem: look at the slightly ominous, abstract-shaped eye in Gilgamesh’s Irisglance (left), by Wolfgang Wackermengel. Or Guillaime Apollinaire’s classic Eiffel Tower, from 1916 (shown above in both English translation and in the original French). All that said, even just rearranging your words in a graphic, visually-minded way is fine, too — especially if it’s done in a way that forces readers to focus on something in particular, or to change the way they’d normally approach your poem. Today’s poetic device continues the focus on the arrangement of words on the page: enjambment. It may sound like a mouthful. But what it describes is a really simple phenomenon: when a grammatical sentence stretches from one line of verse to the next. The rest got kicked over to this line. There’s a lot you can do with enjambment: surprise or shock your readers by throwing in an unexpected word. Restore peace by introducing a full stop right after the first word of the second line. Or bring closure by simply adding the word(s) that were missing to convey a fully-formed thought or emotion. The entire poem keeps crashing on us like wave upon wave (simile alert!) of seawater. Try out some enjambment in your poem today — it usually takes some experimentation, but it’s a fun process (and one which you can repeat during, as well as after, the writing of the poem — you don’t have to get it right from the get-go).